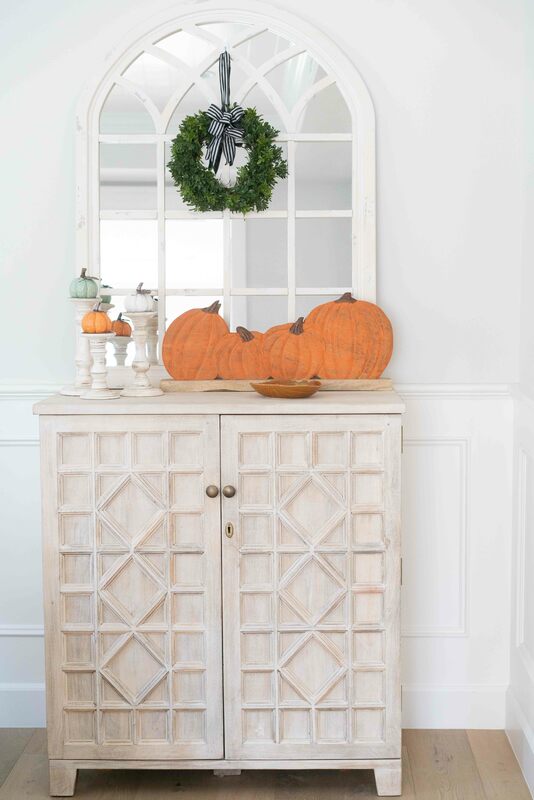 I love decorating for Fall because that means the best time of year is just right around the corner! 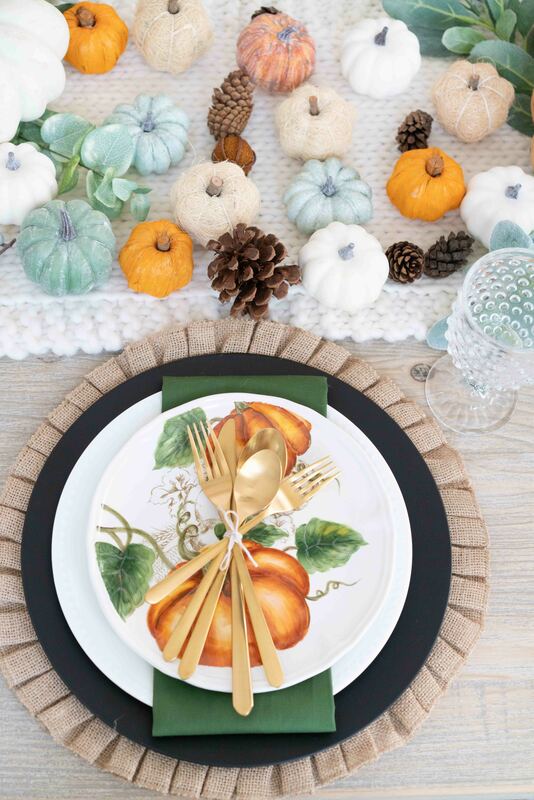 Last year, I showed y’all my dining room and Thanksgiving tablescape in this blog post. I kept a lot of the main elements from last year the same but made a few small changes to freshen things up. I love finding small ways to change up a room that won’t break the bank. Easy ways to do that is adding or changing throw pillows. You can do that by buying new pillows or by simply changing the pillow covers. 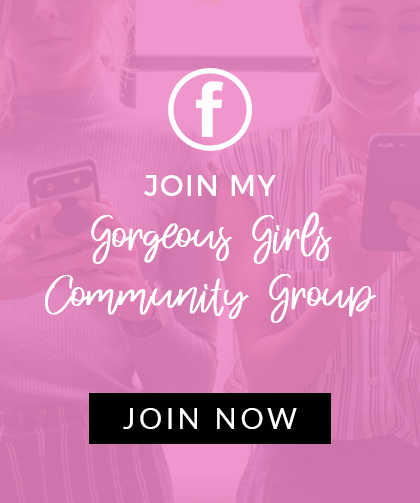 I change my throw pillows out all the time for a quick room facelift throughout my house. I found these black and white plaid pillows at my local Homegoods and fell in love. 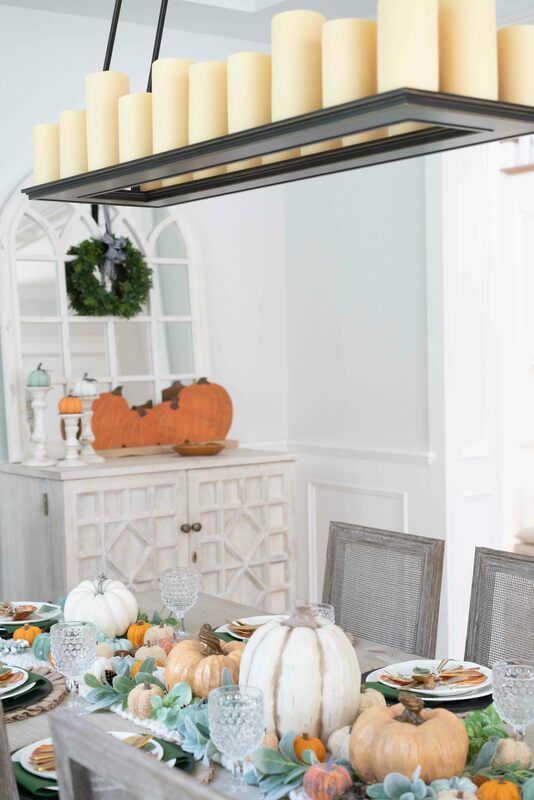 I really liked the way they tied in the light fixture above my table, but I needed to find a way to bring black into my tablescape as well. That’s when I found these matte black chargers at Pier 1 and they did just the trick. About my dining room furniture, my dining table is from Wayfair. It’s no longer available but this table is basically identical in a darker wash. My chairs and light fixture are from Restoration Hardware. These chairs from World Market are dupes for my chairs. These slipcovered chairs from PB are also dupes for my end chairs. This is my rug and it’s so soft for a jute, love it! My drapes (96″ so they’ll lay gathered on the floor), curtain rods/hardware and bar (sold out) are all from Pottery Barn. My mirror on my bar is from Kirkland’s, but I had Matt repaint it because it was way more yellow in person than it looked online. After Matt whitewashed it, it matched my PB bar perfectly. 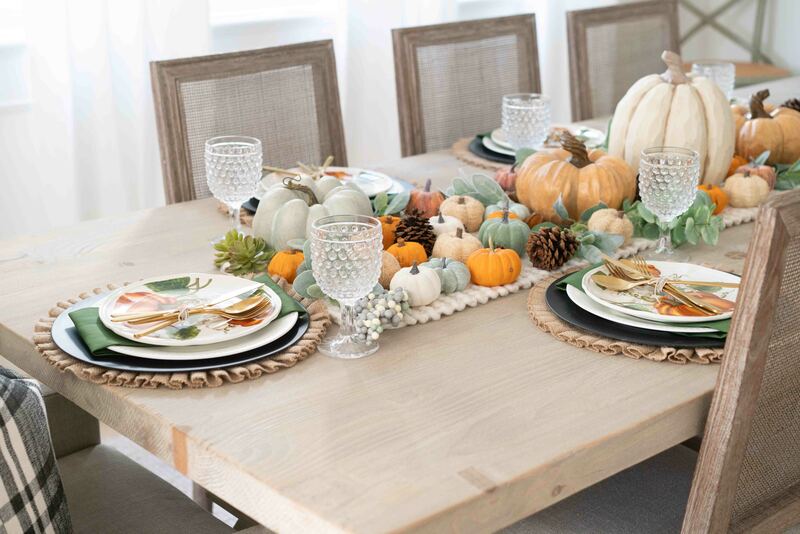 My centerpiece is made up of a beautiful ivory chunky knit runner I found at Homegoods (similar here) and various pumpkins, greenery and pinecones. My pumpkins were all purchased from Homegoods or TJ Maxx and my greenery I snagged at Hobby Lobby and Michael’s. 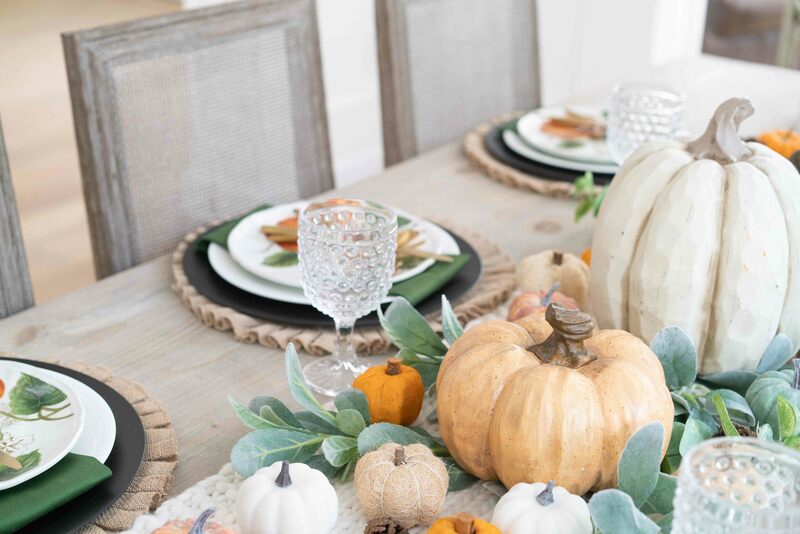 I hope you enjoyed this video tour of my dining room and Fall tablescape! Should I film a video of my Christmas decor? If so, what would you like to see specifically?